Date: 20:27 14.09.18. Batch: 228380090. The amount of 1 USD has been deposited to your account. Accounts: U7594488->U3669097. Memo: Shopping Cart Payment. Withdraw to DaTre from Luxearn.. Date: 20:23 14.09.18. Batch: 228379677. 15.09.18 09:41;Account;Receive;Received Payment 0.75 USD from account U7594488 to account U1294000. Batch: 228425700. Memo: Shopping Cart Payment. Withdraw to allhyips from Luxearn. 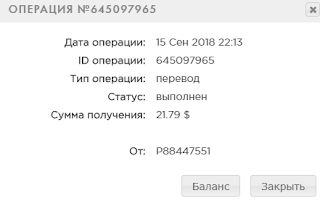 13.09.18 20:53;Account;Receive;Received Payment 0.75 USD from account U7594488 to account U1294000. Batch: 228265248. Memo: Shopping Cart Payment. Withdraw to allhyips from Luxearn. 09.16.18 21:49	Account	Receive	+8.8	Received Payment 8.8 USD from account U7594488 to account U17755**. Batch: 228594665. Memo: Shopping Cart Payment. Withdraw to Knjaz from Luxearn. Memo: Shopping Cart Payment. Withdraw to naale from Luxearn..